Garry Monk says he is relishing the “challenge” of getting Middlesbrough out of the Sky Bet Championship. And he now has more idea of what lies ahead after the Football League published the fixtures for the new season. Boro kick off the new season at Wolves on Saturday, August 5, with the first home match seven days later against newly-promoted Sheffield United, who will field summer transfer target, Nathan Thomas. 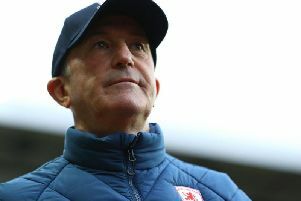 It is a busy opening month for Boro, who have five matches in August.They host Burton Albion on Tuesday the 15th before Saturday games with Nottingham Forest (a) and Preston North End (h). Boro completed a derby double over Sunderland in the Premier League and the much-anticipated Tees-Wear clash is due on November 4 at the Riverside. The local affair follows major tests against fellow relegated team Hull City and beaten play-off finalists Reading. Monk will return to Elland Road on Saturday, November 11, when Boro face Monk’s former side Leeds United, another of the club’s stand-out fixtures. “Personally I don’t tend to look for any individual game – you have to play everyone at some point,” he told www.mfc.co.uk. “But the fixtures show just what the league is and what you’re going to face. “It just shows you how congested and competitive the league can be. “The fixtures will come at you thick and fast, but that’s exciting as well. The festive period is a hectic one with four games in the space of 10 days. Boro travel to Sheffield Wednesday on December 23, following that with home games against Bolton on Boxing Day and Aston Villa on December 30. Monk’s side visit Preston on New Year’s Day.